25 cars will again head out on track for the second round of the 2019 TA2 Muscle Car Series at Morgan Park Raceway, headlining the second round of the Australian Motor Racing Series (AMRS). The entry list features the debut of Super Utes racer Christopher Formosa in the Allgate Motorsport Dodge Challenger. Prepared at the Ross Stone Racing workshop in the lead up to their debut, the team revealed their livery as a nod to General Lee, the 1969 Dodge Charger made famous in the Dukes of Hazzard television series. A relative newcomer to circuit racing, Formosa looks forward to the challenge presented by the growing TA2 Muscle Car Series. 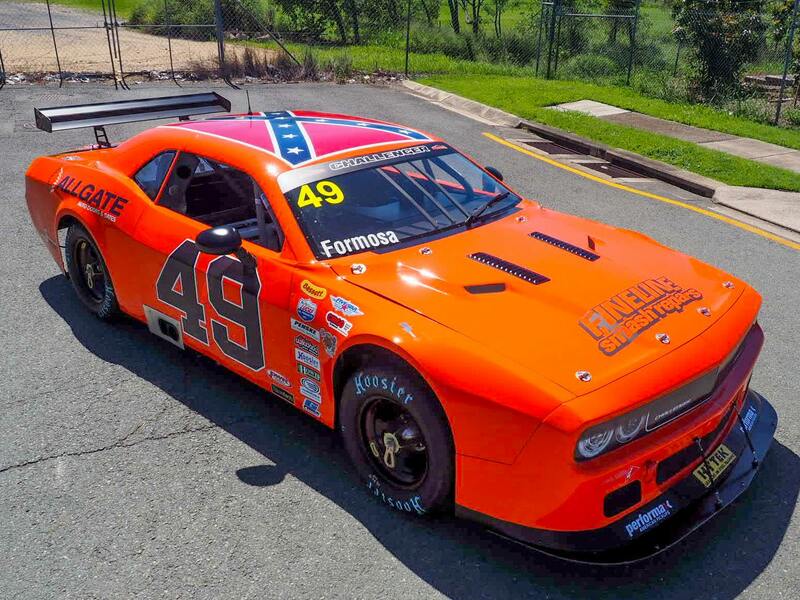 “We’re so excited to join the TA2 Muscle Car Series in the Allgate Motorsport Dodge Challenger,” said Formosa. “We have been keeping a close eye on the series for a while and thought now was a great time to get involved. “It’s not hard to see why the series has grown so quickly. The cars are loud, fast and sideways, not to mention an affordable and strictly-controlled formula. The team have purchased the car formerly driven by Scott Textor. While Textor will not return to the track for the 2019 series, he has retained involvement in the class with sponsorship from Hytek Steel Framing. It will be the second consecutive 25 strong entry following on from a breakout season opener at Sydney Motorsport Park. Victorian racer Simon Tabinor and Queenslander Greg Willis have not backed up from the opening round, while the series welcomes back Sunshine Coast racer David Falvey in a Chevrolet Camaro as well as the debut of the Allgate Motorsport Challenger. Third-generation racer Aaron Seton claimed three out of four race wins to claim the season opener at Sydney Motorsport Park, and holds a four point lead in the Performax Cup standings over other Sydney race-winner George Miedecke, with defending series champion Ashley Jarvis a further 13 points behind. Michael Kulig has had a race against time to repair the Kulig Engineering Camaro after a major hit at Turn 1 during practice for the first round of the series at Sydney Motorsport Park. The car was completely stripped and rebuilt around a new chassis in just four weeks, while Tim Tritton and Chris La Rosa’s Mustangs were also repaired after first round clashes. It will be the first championship round held at the Warwick, Queensland circuit as the 2.967km track hosts the second round of the AMRS. The TA2 Muscle Car Series will commence with private practice on Friday, followed by qualifying and two races on Saturday, and the remaining two races on Sunday. Sunday’s action will be live streamed courtesy of Blend Line TV on the TA2 Racing facebook page.